This is one of my favorite books of all time. I loved the way the author depicts the father-son relationship. All the psychology behind every choice the father has to make, every difficult choice he has to make to keep his son safe, that was one of my favorite part. Overall it's a great post apocalyptic book. I recommend it to everyone. 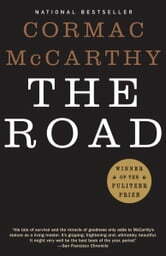 The Road by Cormac McCarthy is a fantastic read. I have not seen the movie yet, but want to see and compare. The words are like poetry with a story that leaves you wondering.